Colorado Avalanche vs Carolina Hurricanes - King Soopers HONORARY HERO OF THE GAME - NHL Feedback!! Thanks to vettix.org, King Soopers, and the Pepsi Center organizations, personnel, and staff for a wonderful time to do a father-daughter night. 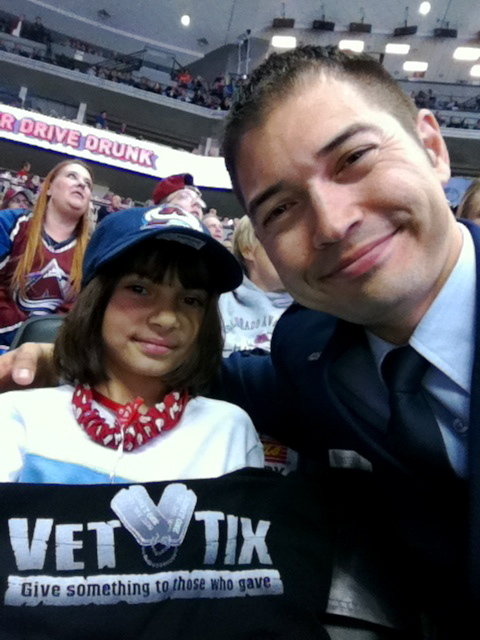 This was T's first NHL game, and the staff at the Pepsi Center made sure to treat her like a star. We made some great memories, and she couldn't stop talking about all the fun she had! We've been working really hard to work for several weeks through some heavy emotional issues because I've been called away to duty more than she can handle. Thanks for giving us the opportunity to re-connect! Also, it's a tremendous kindness for King Soopers to offer the Honorary Hero of the Game to active duty and veteran members. The same can be said for both the Pepsi Center and vettix.org. Thanks for your dedication, professionalism, philanthropy, and all you do to honor our servicemen and women--to feel welcomed in the community in ways like this is a powerful re-connection back to our families, friends, and hometowns.